We invite you to explore India - the Land with infinite beauty ! Whether you soar high into Himalayas or peer under the ruins of the Ancient monuments dotting the landscape of India, you will cherish the experience long after your visit ! 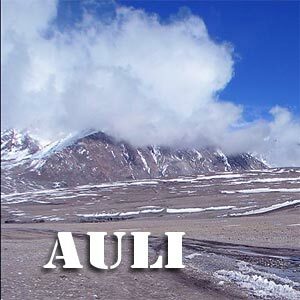 This India Travel Guide on Auli Ski Resort is free from any commercial interest! This site is dedicated to promote India - the vast subcontinent, its glorious past, magnificent landscape and its infinite variety. Auli is a premier skiing destination in India. It is located in the Garhwal hills in Uttarakhand. Auli officially comes under the Chamoli district and serves as one of the important routes for the Char- Dham; important Hindu pilgrimage region. Auli is a picturesque Indian destination for skiing and little wonder that it hosted the Winter Games in the year 2010. The training facility for the Indo Tibetan Border Police is located here. The ski resort in Auli is maintained by the Garhwal Mandal Vikas Nigam. There are slopes to attract novices and seasoned skiers alike. You can use the 500 m long ski lift and the 800 m long chair lift to move between the slopes. The ski slopes at Auli descend from 3049 metres to 2915 metres. The slopes make for a spectacular snow carpet; with breathtaking visuals of the pine forests and snow covered peaks. The cable car links Auli to Joshimath. The 5 km long ropeway is the only transport during snowstorms. This is one of Asia's longest cablecar systems. The resorts here are located in serene locations with snow views right from the windows of the hotel. People are welcoming and friendly. Clifftop Club is one of the prime ski resorts of Auli maintained by the GMVN. The National Snow Skiing Championships and skiing festivals are held around January - March. Training instructors from Skiing and Tourist Resorts, Auli and Indian Institute of Skiing and Mountaineering, Gulmarg conduct training courses in modern skiing techniques. Tourists often spend a few days to few weeks in this region to participate in programs like trekking, parasailing and skiing. The board of tourism also conducts training sessions for skiing and other adventure sports. You can see some of the great Himalayan peaks - Nandadevi, Mana parvat, Nilkantha, and Hathi - Gauri Parvat. Skiing enthusiasts must visit Auli between end-December and March. The closest airport is at Dehradun, 273 km. A road journey to Auli takes about 9 hours. There are regular buses to Joshimath, Rishikesh, Haridwar, Dehradun and Delhi. The Dehradun Shatabdi Express takes you from Rishikesh to Joshimath. Temperatures in summer hover around 15°C. Winters can be severe with minimums going to sub-zero levels. The meadow of Gurso Bugyal is a scenic area popular for picnics. Kwanri Bugval is also known for its summer camps. Bugyal means meadow in the local language. The hot springs at Saildhar Tapovan are another attraction. If you are game for a bit of a trek, visit the pristine Chenab Lake. The beautiful cave of Kalpeshwar is about 12 km from Joshimath. The shrine of Bhavishya Badri is located in the region. Joshimath is home to one of the main Shankaracharya Mutts. You can also visit the Narasimhadeva Temple and Vasudeva Temple. Trekking paths are aplenty for those who are avid enthusiasts. Single day treks can be done on the Auli-Gorson, Gorson-Tali all the way to Khulara-Tapovan route. The area sports a festive look around September when the Mata Mruti ka Mela is held in Badrinath. At an altitude of about 7160 m, Trishul Peak is a popular tourist draw in Auli. This is a good skiing spot. Visit the Roopkund Lake when in this area. Your trekking expedition can take you to Nandaprayag, the sacred confluence of 2 holy rivers. Many pilgrims visit the Gopalji temple on the banks of the Alaknanda.